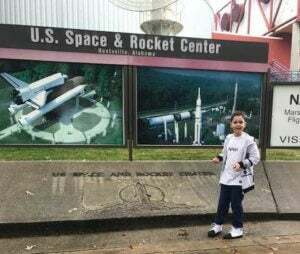 Riley standing in front of the U.S. Space & Rocket Center, Huntsville, Alabama. I would like you to meet my wonderful son Riley Lynch. Riley is 10 years old, a wonderful student, and was born with Fragile X. From the day Riley was born, we knew he was different—and special. My husband and I were told he would never walk, talk, or do much of anything. One doctor went so far as to say he wasn’t even going to live. My husband and I ignored all the comments and continued to advocate for Riley, and to make sure he is always given the same opportunities every child deserves. Riley meets astronaut Mark Vande Hei at space camp. This past summer, Riley sent in a video as his application for space camp. His dream is to become an astronaut. We must own at least 40 books on astronauts and space! 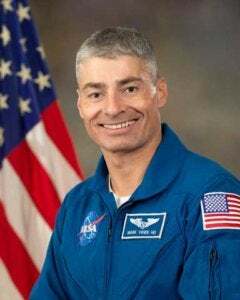 The day came and the directors called; not only was he accepted, we were overwhelmed to find out he was chosen to meet a real life astronaut—Mark Vande Hei!!! 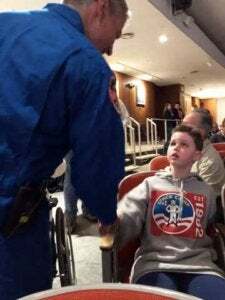 When they met, Riley could not take his eyes off of him while he talked about his mission to space. I was sitting in the corner, tearing up while watching my son realize that this was something he could do. His entire space camp family was so loving and encouraging, he still has not stopped talking about going to the moon! It was an experience he will remember for the rest of his life. So, for anyone who labels kids like Riley or puts limitations on them: You never know what will happen tomorrow. Every day our son teaches us and the people around him that you never know what you can do unless you try. He has already started to leave his mark on this world, and we could not be any more proud to be his parents. Riley, someday we’re going to look up in the sky and see you waving from the moon. Keep chasing your dreams. You will make them happen, you always do. We love you. Who is Mark Vande Hei? When you get the opportunity to do something hard, even if it means that you’ll risk failure, go for it. If you fail, figure out what you should change and try again. We hope you find this resource helpful in your own Fragile X journey. A key part of our mission is to provide helpful resources to families, caregivers, educators, and clinicians to better provide for this living with Fragile X. Our website is the top way we deliver our resources. In fact, 350,000 people/year use our website to learn more about Fragile X. All of these resources are provided free-of-charge. We don’t have a membership or subscription fee. We rely on donors like you to make all of this possible. Will you consider a donation today? Your donation will help us to provide more resources, update resources, and reach more families. Your donation will help a family with their next struggle, challenge, or hurdle. You can donate securely online: https://give.fragilex.org. Studies involving the impact of an ASD co-diagnosis in FXS have to date relied mostly on parent-reported data and/or smaller sample populations. But thanks to the registry and longitudinal database FORWARD—the Fragile X Online Registry With Accessible Research Database—plus standardized clinician- and parent-reported data from 25 Fragile X clinics, we now have access to samples large enough to include a breakdown of findings by age groups. Dr. Elizabeth Berry-Kravis at Rush University is the Protocol Principal Investigator and is leading a national study, NN107 FX-LEARN. There are two purposes to the study. First, to find out if the drug AFQ056, made by the pharmaceutical company Novartis, is safe and has beneficial effects on learning in children who have Fragile X syndrome (FXS). Second, to find out if a structured language intervention can help children with Fragile X syndrome communicate better.